We have access to some of the best Wild Turkey habitat in the state of Oregon. In the early season we are looking to get a jump on the excited birds with heavy calling. Later in the season we will locate birds early, setup to ambush and do light calling. 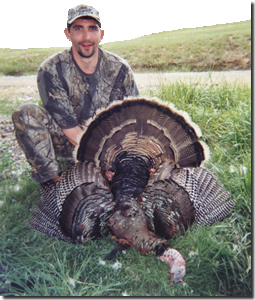 We have both public and private land hunts. We have large populations of both the Rio and Merriam sub-species of Wild Turkey, with 10-inch beards being very common! Because we have exclusive access to private ranches, many of these birds are un-hunted and uneducated! Oregon has one of the fastest growing Wild Turkey populations in the country.